Henry Cavill News: Zack Snyder: "We're Working On 'Justice League' Right Now"
Zack Snyder: "We're Working On 'Justice League' Right Now"
Director Zack Snyder, just made the first Monday of 2016, even better! First we get a new interview with Henry talking to Cineplex about Batman v Superman, and then Zack tops it off with words we love to hear: "We're working on Justice League right now." It was great. They're fun, they're smart, they're enthusiastic. It's a difficult process, you know making a superhero movie it's a lot of costumes.. and it's like long hours. We shot in Detroit in the winter and it's cold, and it was hot in the summer.. just there was a lot of adversity. But those two guys are complete troopers, and they really just put their heads down and did amazing work. Warner Brothers and DC Entertainment are working with Doritos on a Super Bowl ad campaign (see the three finalists), which is why Zack is doing press right now. 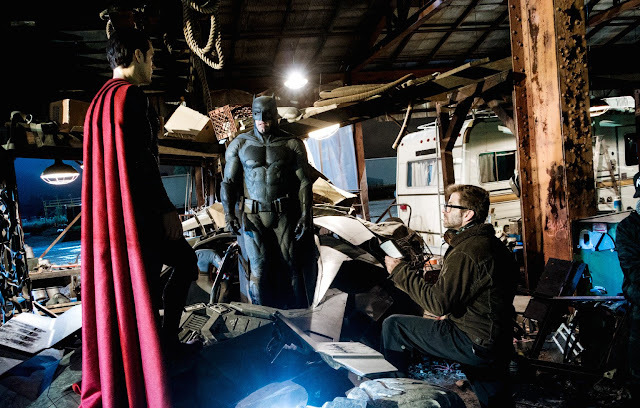 And you know that 99.9% .. nah, 100% means a new Batman v Superman spot at the Super Bowl! -- Plus look for that Doritos bag when the film opens in theaters March 25: "Coming soon to Metropolis & Gotham." Also about to be released, the Batman and Superman cereals we've been hearing about. They are supposed to hit stores later this week. Read all the details. Batman v Superman is all the buzz, in a new poll by Fandango. Check it out. Finally, The Guardian (UK) has placed the film on its list of "The Most Unmissable Culture of 2016." The DC Comics film universe belatedly gets into the match-up business with this follow-up to Man of Steel that pits, yes, Batman against, you guessed it, Superman. Henry Cavill returns as the latter while Ben Affleck shoehorns himself into cape and body armour as the Man of Bat. Prepping future films, we’ll also see glimpses of Wonder Woman, Aquaman and Cyborg, with Jesse Eisenberg on hand as Superman’s nemesis, Lex Luthor. 2016, we are SO happy you're finally here. Much more to come! So James Bond is impossible. I'm very sad. Henry will never have a big career if he only plays Superman. He deserves to be known by more people.